Explanation: Last week Mercury wandered far to the west of the Sun. As the solar system's innermost planet neared its greatest elongation or greatest angle from the Sun (for this apparition about 27 degrees) it was joined by an old crescent Moon. The conjunction was an engaging sight for early morning risers in the southern hemisphere. There the pair rose together in predawn skies, climbing high above the horizon along a steeply inclined ecliptic plane. 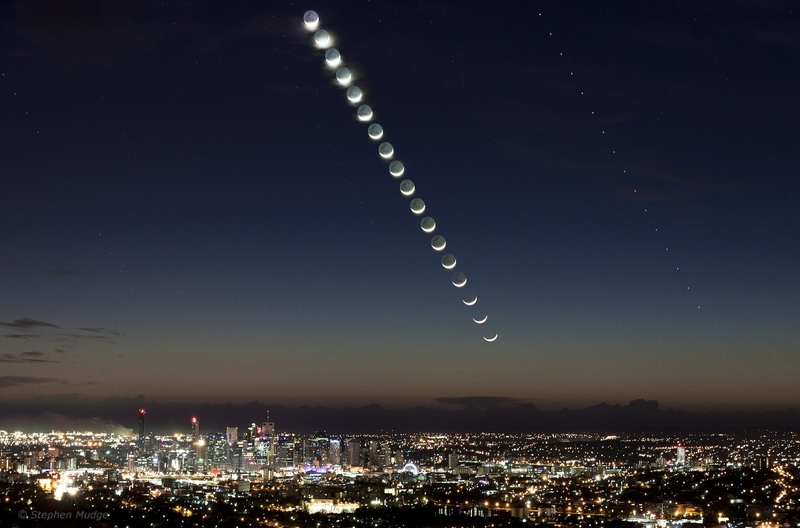 This well composed sequence captures the rising Moon and Mercury above the city lights of Brisbane in Queensland, Australia. A stack of digital images, it consists of an exposure made every 3 minutes beginning at 4:15 am local time on April 19. Mercury's track is at the far right, separated from the Moon's path by about 8 degrees.